Subway stations are traditionally dark places, where natural light rarely shines. But the most visible sign of progress at the Government Center Station renovation project is the construction of an entryway called a “head house,” which is set to be wrapped in glass and promises to brighten the underground transit hub when it reopens in the spring of 2016. During a tour of the work site last week, Howland highlighted milestones reached during the first six months of the $82 million project and some of the artifacts that have been uncovered. He said work is running on time and on budget. An old collector’s booth at Government Center station. Crews spent 4½ months demolishing just about everything inside the station, which opened in 1898 as Scollay Station. It was renamed Government Center in 1963, Howland said. Underground, steel support beams on the Green Line level were reinforced to hold the weight of the head house, which now rises about 40 feet above City Hall Plaza. “That’s the biggest milestone. For the first time you’re really going to get a sense of the size and scale of the new structure,” Howland said. Another one-story, glass-enclosed head house is also planned to accommodate doors for customers and automated fare collection gates, he said. The structure is designed to replace the brick bunker-like structure that had served as the entrance. The design also calls for an entry-level flooring system made of concrete and block glass to maximize the amount of natural light that filters into the station, Howland said. The station, which serves the Green and Blue lines, closed March 22 for a two-year rehabilitation project aimed at making the subway stop accessible for people with disabilities. Until it reopens, trains will continue traveling through the station, but commuters are not allowed to board or disembark there. The last major construction project in the neighborhood dates back to 1969 when the Center Plaza complex was completed, Howland said. Earlier in the project, crews uncovered two historic tile mosaics from the days of Scollay Station that the MBTA did not know about. All together, there are five historic signs in the station, three reading “Scollay Under,” one featuring the letter N, and the other the letter S.
Since then, workers have also found a portion of a wrought iron gate from the entrance to Scollay Station and a booth where customer service agents worked going back to 1898, Howland said. 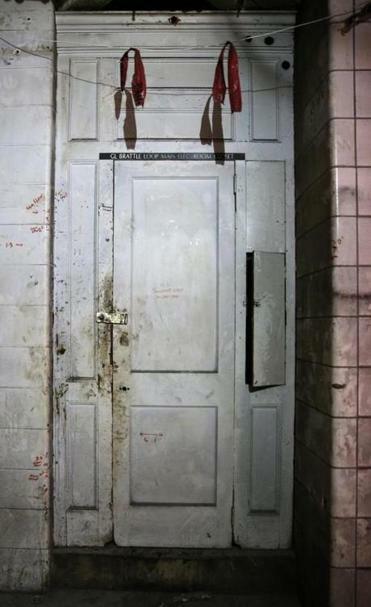 The booth was found inside an electrical room and had its original door and customer service window. “It sat in here for over 100 years without being touched,” Howland said. 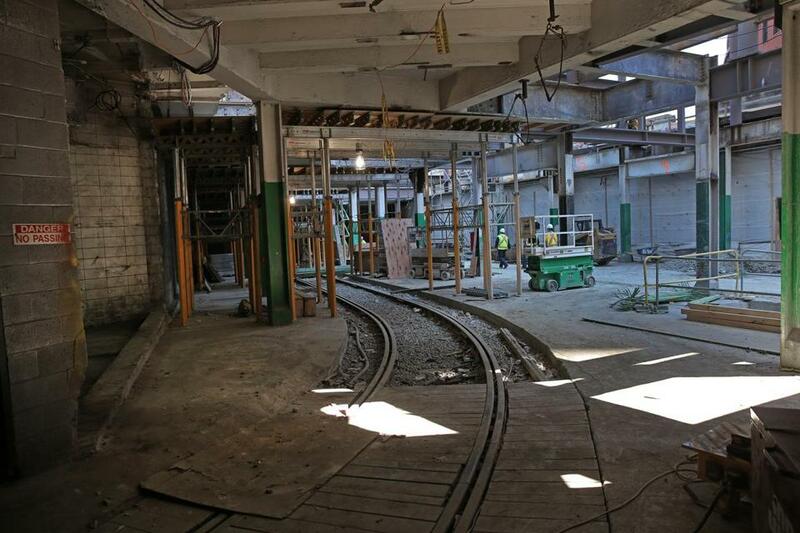 The MBTA plans to incorporate these vestiges of the station’s early days into the rehabilitation work, but their exact use has not been determined, he said. In the next few weeks, more work is scheduled to begin on a cornerstone of the project: the installation of four elevators to bring the station into compliance with the federal Americans With Disabilities Act. Three escalators are also planned. “It’s a busy downtown station and it’s never been accessible to people with disabilities or other mobility challenges,” said Joe Pesaturo, a T spokesman. Another key part of the project is replacing the 600-volt electrical systems to power trains and the station, Howland said. The design calls for the new equipment to occupy two electrical rooms, he said. The Green Line tracks at the Government Center T station. A retail space is also planned for the Green Line level of the station, Howland said. One of the last phases entails landscaping the exterior with features such as trees, retaining walls, and seating areas. Howland said he expects those enhancements to improve how people use the space, which sits just outside Boston City Hall and near Faneuil Hall Marketplace.